I'm not sure I could ever actually work in a real firetower—I have a pretty powerful fear of both heights and fire—but I love the idea of it. The isolation, the air, the overwhelming beauty of the natural world; it's maybe a weird thing for a guy who spends the bulk of his waking hours behind a keyboard to say, but that's the life for me. Which is one of the reasons I'm so jazzed for Firewatch, a game about watching for fires (and doing other Forest Ranger-y stuff) in the deep Wyoming wilderness. The gameplay video posted by IGN First is set on the second day of your new job as a Ranger, and covers quite a bit of what the game has to offer, including the map, landmark navigation, the conversation system, and the distinct feeling that something, somewhere, isn't quite right. The voice acting is great too, although that's come across very clearly in previous videos. And of course it looks fabulous: Not realistic, but tremendously evocative of the real thing. 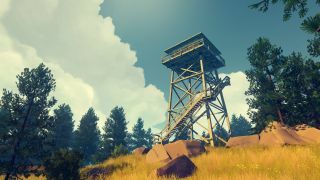 Barring unforeseen disaster, Firewatch will be out on February 9 of 2016. In the meantime, you can watch (get it?) our Firewatch hands-on, in which Wes discovers a bigger, weirder tale than he expected, right here.